The Historic Scoot Inn presents "Lumberjack-Off"
The Historic Scoot Inn is calling all flannel-wearers and lumberjacks to show off their skills in the "Lumberjack-Off," which includes contests with keg lifting, arm wrestling, burping, dancing and more. Guests can feast on pancakes and bacon from the Cazamance food trailer whiley the admire the spectacle — and everyone is encouraged to dress up like a lumberjack or their favorite woodland creature. 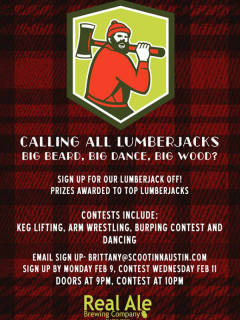 Sign up to compete by Monday, February 9 or just come by the "Lumberjack-Off" to enjoy the fun.